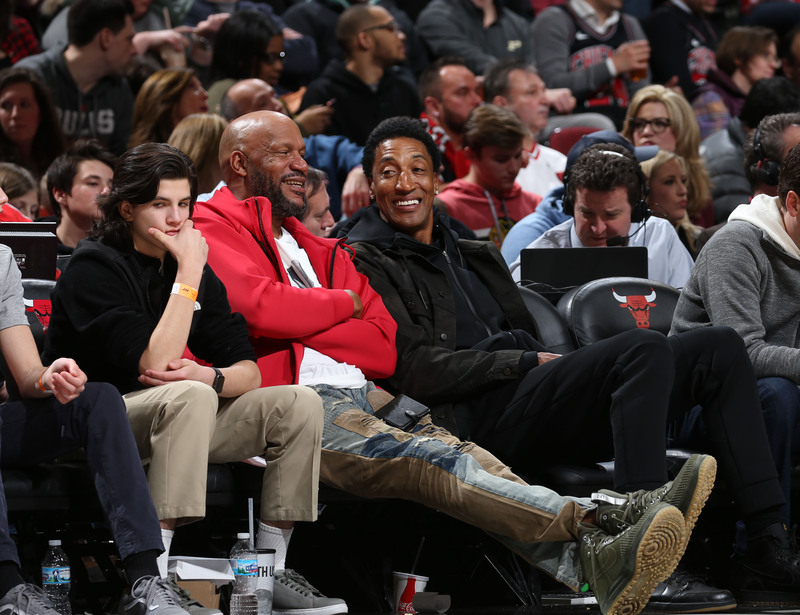 Bulls legend Scottie Pippen takes time out to talk to The Crossover about the NBA playoffs, his favorite up-and-coming team and LeBron James. Pro basketball Hall of Famer Scottie Pippen recently filmed an episode of “Off the Record” for the House of Hoops Instagram account. While on set, he caught up with The Crossover for a Q&A on the playoffs, the best young talent in the league, LeBron James’s future and much more. Mitch Goldich: The playoffs have been fun so far. How much basketball do you watch this time of year? Scottie Pippen: I watch three or four games a night, as many as they put out there. MG: What do you think about the amount of talent in the league right now? SP: I think it’s great. I think the league has always had great talent. We’ve seen the last few years where some teams are a little more stacked than others, but I think the talent pool is pretty spread out. MG: Yeah, and we know about the superstars but what do you think about some of the young players who have come into their own this year? SP: It’s been a great year for young players. Donovan Mitchell and Ben Simmons have definitely been the leaders of the class this year. It’s been exciting, and even more exciting to watch them in the postseason. MG: In your career you’ve been on both ends of the spectrum. You’ve been the young team trying to get over the hump and win your first title, and then you’ve been the veteran team rallying to go on another run. How are those two mindsets different for teams going into the playoffs? SP: Well, I think when you’re a little younger, you’re still going through the process and learning on the fly. As a veteran and an experienced player, who’s been able to win in the postseason, there’s a sense of confidence that you feel as you go forward. And it’s much better than being in a situation where you’re trying to win your first one. MG: So what advice do you have for teams like the Warriors and Cavs, who’ve been in the Finals the last three seasons and are trying to get back for another trip? SP: Well, those teams know what it takes. They just want to be healthy throughout the postseason, and make sure that they’ve got all their troops there. I think as you go through the season, you build a confidence that you can beat anybody and everybody. You just want to be healthy and go out and give your best effort. Every team that’s playing in the postseason thinks they have a chance to win the title. And that’s the beauty of it—everyone starts with a clean slate, and it’s the first one that can win 16 games. MG: How about the young teams? Of the up-and-coming teams, who do you think has the brightest future right now? SP: Well, I gotta go with a team from the East and a team from the West. If I go with a team from the West, I’m gonna go with the Utah Jazz. I think Donovan Mitchell has shown that he’s a leader, he’s definitely going to be a star in this league. And I think that they’re a team that’s gonna be in the postseason for many years to come. Then you look at the Sixers’ team with Joel Embiid and Ben Simmons. They’ve surprised everybody this year. You talk about a team that wasn’t even being thought of in the postseason the last five years, and now here they are having the opportunity to win in the first round. It’s going to be important for them to continue to bond and play together, and as they grow they will get better. But it’s been great to watch them develop. They went into the postseason playing the best basketball. MG: There’s always so much talk about LeBron and his future and what he should do. Do you think the postseason matters in his decision about where he should play next year? SP: I don’t think this postseason is going to affect his decision. Whatever decision he’s gonna make, he probably made his mind up before this postseason. I don’t think that the outcome is gonna detour what he’s doing next season. And I think LeBron probably would love to finish his career in Cleveland. He’s been a great role model for the city and a leader for them. I see that he continues to carry that on.